NEW YORK -- A popular baby toy used for teething infants has parents on high alert after some say they found mold inside their Sophie the Giraffe dolls. Pediatric dentist Dana Chianese told GoodHousekeeping.com when cleaning her child's Sophie, she smelled a musty odor. She says she decided to cut open the doll and "discovered a science experiment living inside." Chianese told Good Housekeeping she always cleaned the toy according to instructions, which say to use hot, soapy water with a damp sponge and never submerge the toy into water. 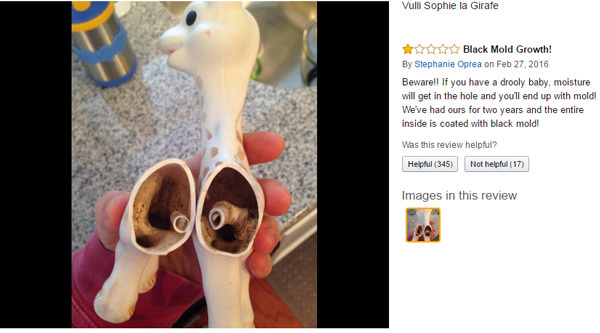 An Amazon reviewer also posted a photo of mold found inside her Sophie doll. The toy is made by a company in France. "First of all, it's important to know that Sophie la Girafe [Sophie the Giraffe] is composed of 100% natural rubber, so the cleaning instructions have to be carefully respected. 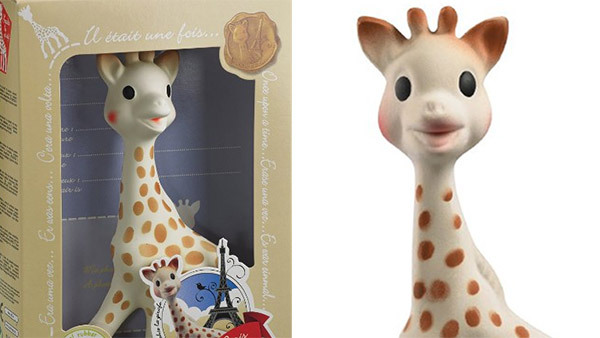 As indicated on the packaging and in an explanatory leaflet inside the packaging, we recommend to clean the surface of Sophie la Girafe with a damp cloth. It should not be immersed in the water nor rinsed off, to prevent water from getting inside, as she may become damaged. We thus would like to emphasize on the fact that is it important, while cleaning the product, that no water gets inside the whole." The statement goes on to say "the safety of children and satisfaction of their parents is our main priority" and they take each complaint received very seriously.